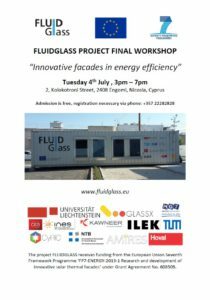 Final FLUIDGLASS workshop is scheduled for 4th July 2017. The workshop will be organized within FLUIDGLASS M48 meeting and will take place in the Gravity Incubator, Engomi, Nicosia, Cyprus. First part of the workshop will be dedicated to the role of façade within the concept of the low-energy building, while the second part will be focused on the description of the FLUIDGLASS façade concept and demonstration of validation results. The target group of this event will be compounded of the energy experts and researchers from the local companies and institutions. If you are interested in taking part in the workshop, please do not hesitate to contact us. This edition of Futuris comes from Liechtenstein to look at a project that is developing windows which could provide a source of energy. Euronews correspondent Julian Lopez Gomez spoke to those involved and saw an example of the windows mounted on a container. and the inner face is able to cool or heat the space inside the container,” he said. The windows are fed with a circulating fluid that can be dyed. So they turn into an active tool for energy saving. And not only that. “Windows can be shaded, so they protect against sun rays. Then they also heat or cool down the interior. And they can be turned into solar collectors. They absorb solar radiation and use it for the energy consumption inside the building,” said Anne-Sohie Zapf, architect, University of Liechtenstein, and Fluidglass project coordinator. In ideal conditions each window can produce up to 1 kilowatt of energy per hour. The fluid inside the window glasses is a mixture of water, anti-freeze and magnetic particles. Scientists say their main challenge was to ensure its long-term stability. So they looked for particles with very precise features. “The particles shouldn’t agglutinate, by that I mean they shouldn’t clump together. They shouldn’t deposit over time on the window, but stay in a solution, and, if needed, they should be easily filtered out,” explained Daniel Gstöhl, Mechanical Engineer NTB. And then it was also necessary to ensure that the fluid was injected into the windows in safe, homogeneous, efficient ways. “The main difficulty was to find the correct operating mode. The glass shouldn’t be operated under pressure, because in this case it would deform over time, and we wouldn’t have the regular distribution of the particles. Which means that we had to operate the whole thing under low-pressure. So the whole circuit changes from high to low pressure. And then other problems appear that also need to be addressed,” said Stefan Frei, Mechanical Engineer, NTB. Sophisticated computer models were also needed to determine to what extent, and under which conditions, the shading windows can better manage inside temperatures. “We confirmed that you don’t need any additional heating or cooling system, as for example an air conditioner or a heater. That was already one of the important things that we could determine on computers. And now that has to be validated with the real tests in the container,” stressed Laura Baumgärtner, Civil Engineer, University of Liechtenstein. These real tests, performed in Vaduz in winter and Cyprus in summer, will show if the shading windows are indeed able to heat and cool down the space inside the container. And while waiting for the results, researchers are already thinking ahead. “We expect the main application could be in multi-story office building with a high percentage of glass surface in their facades. But we’ll need to find solutions, as the wind makes it difficult to shadow buildings with large glass surfaces. ‘Anyway we see large office buildings as our main target, as individual houses have less glass surface, and to become efficient, our system needs as much glass surface as possible,” Anne-Sophie Zapf, Architect, University of Liechtenstein, Fluidglass Project Coordinator, pointed out. Scientists say these energy efficient windows could become a market reality in less than four years. Third year of the FLUIDGLASS project was successfully closed with finalization and assembly of the showcase container. 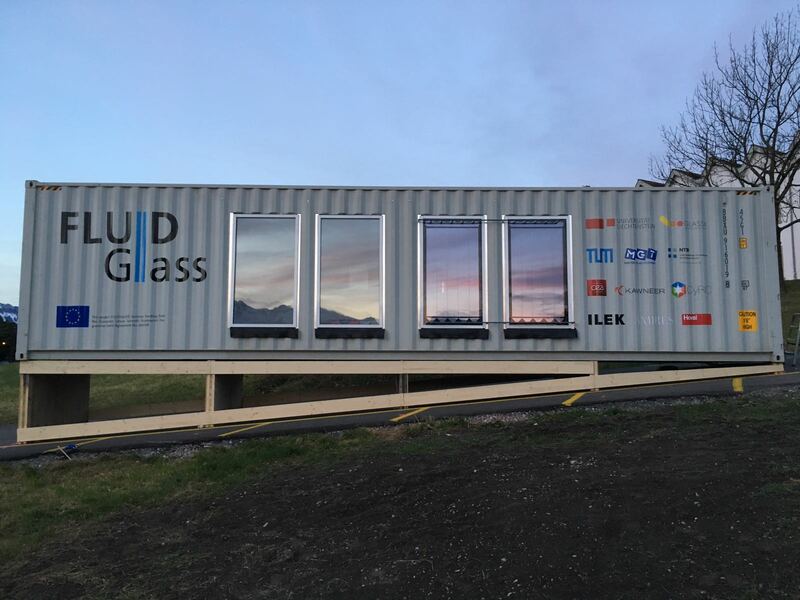 Currently, the container is installed at the premises of University of Liechtenstein in Vaduz, Liechtenstein and its validation phase has just started. During Spring 2017, the container will be transferred to Cyprus to be tested also in hot climate. Results from the container´s validation will be presented during the last year of the project. 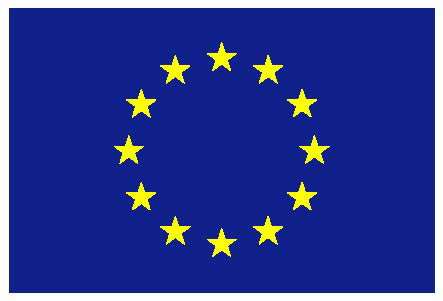 We would like to inform you about the completion of FLUIDGLASS project’s second period through the submission of periodic report to European Commission. Significant progress was made in all parts of the project including development of collector, development of the facade system, system simulation and integration as well as testing of the prototypes. The consortium received a positive feedback and strong encouragement from Project Officer. The FLUIDGLASS team will meet again in Buchs, Switzerland for a personal Project Steering Committee meeting. A two day meeting has been planned in order to discuss further FLUIDGLASS progress and plan the testing activities for the last year of the project. During this annual meeting a workshop dedicated to design and manufacturing of the container and demonstrator intends to be organized as well as a workshop on system integration. FLUIDGLASS project will be presented at GLASSTEC 2016 – International Trade Fair for Glass Production, Processing and Products, that will be organized in Düsseldorf, Germany on 20 – 23 September 2016. Glasstec 2016 will again enable world-wide industry professionals to come together in one place and find everything that might interest them: from glass production technology, glass processing and finishing, to glass products, glazing, window and door making, and architecture. Furthermore, the show offers in-depth insights into future developments in the glass industry. Glass manufacturers and finishers put sophisticated glass applications on display that will even captivate the industry veteran. glasstec continues to serve as a forum for collaboration between manufacturers, architects, designers, and end users. FLUIDGLASS showcase prototype will be exhibit as a part of tradefair in Hall 11 / section D42. Moreover, FLUIDGLASS project will be presented at the conference organized as a part of Glasstec 2016 by Mr. Martin Schroecker from GlassX company. FLUIDGLASS project will be presented at the Central Europe towards Sustainable Building 2016 conference that will be held in Prague, Czech Republic on 22 – 24 June 2016. FLUIDGLASS presentation will be part of the AMIRES stand at the exhibition, which is a side-event of the CESB 2016 conference. Visitors will have the opportunity to check the posters, roll-up and other dissemination materials of the project as well as to speak with the Project Manager from AMIRES company. Prof. Dietrich Schwarz from University of Liechtenstein gave a short interview on FLUIDGLASS topic to “Der Standard” newspaper in Vienna in January 2016. Summary of this interview was presented in an article called “Die Glasfassade als Energiemanager” which was part of the Forschung Spezial issued on 13th Januray 2016. 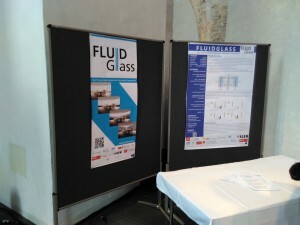 FLUIDGLASS project was presented at World Sustainable Energy Days that were organized in Wells, Austria on 24 – 26 February 2016. The World Sustainable Energy Days, a large annual conference in this field in Europe, offer the combination of events on sustainable energy production and use, covering energy efficiency and renewable energy sources for buildings, industry and transport. Four conferences, which presented the latest technology trends, outstanding examples and European strategies – and the “Energiesparmesse“, an important energy trade show, offered opportunities to establish new partnerships. The conference made an important contribution to awareness-raising for green energy and energy efficiency. FLUIDGLASS consortium was represented by Martin Schröcker (GlassX), who presented a paper “FLUIDGLASS: a new concept for adaptive facade systems” in Smart Façade Materials conference as a plenary talk in front of about 100 guests from industry and the academic world. FLUIDGLASS consortium participated also in Tradeshow “Energiesparmesse”, where a FLUIDGLASS booth was organized. Pictures from the event can be found in Gallery. More information on the event can be found here.